Microsoft has just made it pretty simple to set up and use multiple virtual desktops on your Windows 10 computer. Using multiple desktops are great for keeping unrelated, ongoing projects organized, or for quickly hiding from the boss that browser game and movies you can't stop playing while being in office. 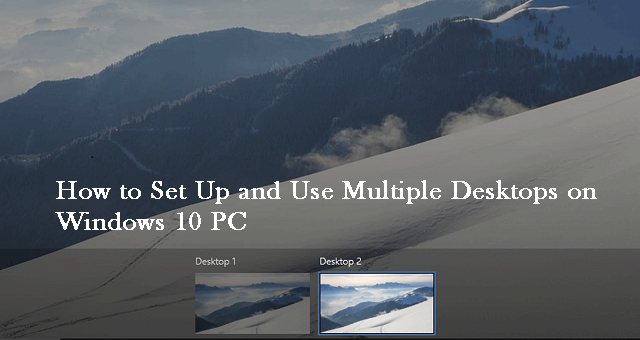 In this guide, we'll walk you through the steps to set up and use multiple virtual desktops on your Windows 10 PC. Click the Task View button in your taskbar. It looks like a square over a rectangle. You can also simultaneously hit the Windows key and Tab key together on your keyboard. Click New Desktop. It's located in the bottom right corner of your screen. If you want to skip the two steps above, you can use this keyboard shortcut: ctrl + Windows key + D.
Click the Task View button in your taskbar. It looks like a square over a rectangle. You can alternatively hit the Windows key and Tab key together on your keyboard. Click Desktop 2 or any other virtual desktop you've created. You can switch back to your original desktop at any time by following the above steps but choosing Desktop 1. If you want to skip the two steps above, you can use this keyboard shortcut: ctrl + Windows key + left arrow/right arrow. There are two ways you can move windows between virtual desktops. First, you can click and drag windows; second, you can right-click the window and use the menu. Click the Task View button in your taskbar. It looks like a square over a rectangle. You can alternatively hit the Windows key + Tab key on your keyboard. Click and hold the window you want to move. Drag and release the window on an alternate desktop. Right-click on the window you'd like to move to another desktop. 3. Hover your cursor over Move to. 4. Click the desktop to which you'd like to move the window. You can move windows back and forth between desktops to your heart's content. Hover your cursor over the desktop you'd like to remove. Click the X in the top right corner of the desktop icon. Open and running windows in a desktop you close will be moved back to your original desktop.